In the spirit of heading off to London (baby!) tomorrow, I’m already holding on to spirits today. But not just spirits. 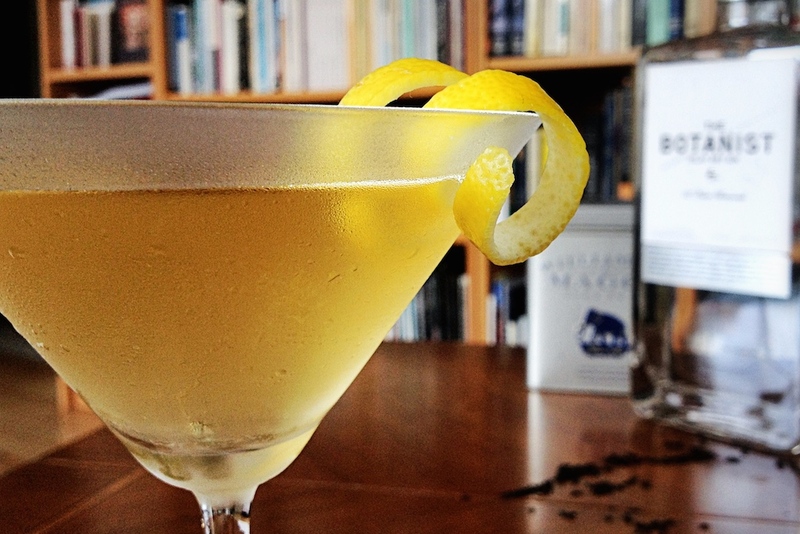 This drink combines two very iconic British drinks: gin and afternoon tea. It’s a special kind of – G & Tea, if you like. In the light of recent events, I am very consciously using the term ‘British’, since afternoon tea is a very English tradition and the particular gin we used and recommend for this drink comes from the tradition-steeped Bruichladdich distillery in Scotland. And we believe, these two go very well together, ‘we’ meaning Alex and myself. Alex is master of our in-house bar (and keeper of the rather astonishing number of gins we have accumulated over the years), and for the first time today we came up with a recipe and blog post together. Because in the afternoons, we often cannot decide whether we want a drink or a cuppa, today, we just went for best of both worlds. And shortbread. Basically, this is a classic Martini cocktail: a good measure of gin with a rather modest addition of vermouth, stirred ice cold with a dash of orange bitters and a lemon twist. For our little afternoon drink, we keep it classic by using a rather conservative measure of vermouth, but instead of just aiming for the 1980s drier-than-anyone-would-enjoy version, we go even more classic back to the late 1800s and use an Italian vermouth, which is considerably sweeter than the now common French variety. 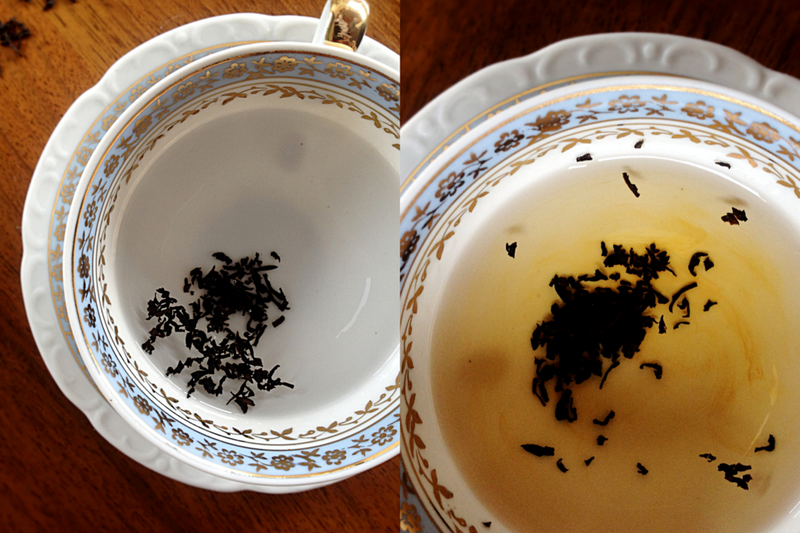 The twist is provided by the zesty bergamot aroma of Earl Grey tea. We simply infuse the gin with the tea leaves for a short while (funny that the diplomat’s wives on Long Island disguised the booze as iced tea while we hide the tea in the booze…). The Botanist gin we used has a pronounced sharpness to it, with a classic juniper aroma. The Italian vermouth on the other hand is sweet and soft with an aromatic deepness. The gap between these two distinct spirits is perfectly bridged and filled by the heady bergamot scent and the slightly bitter tea flavors. The result is a smooth and extravagant afternoon cup which is also elegant enough to serve as your next supper party aperitif. If you have enough room, chill a classic cocktail glass in your freezer before making the drink. If you don’t: fill the glass with ice cubes and set it aside. 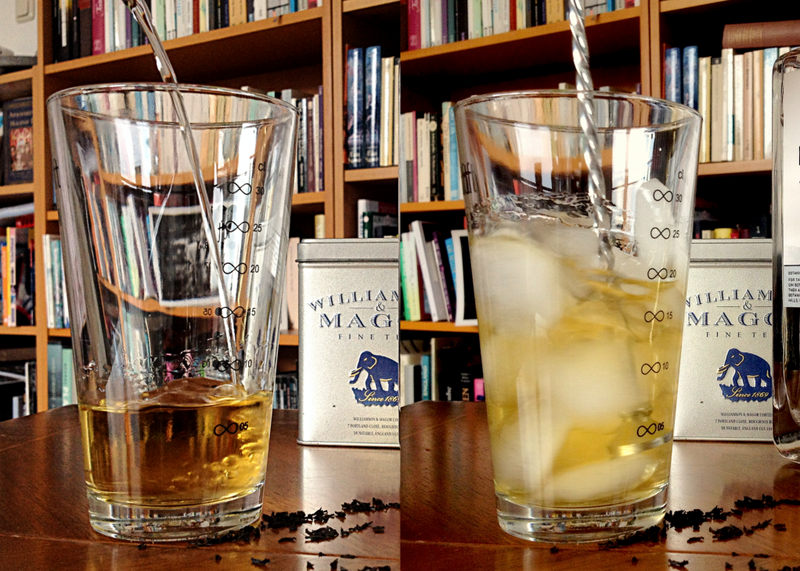 Steep the tea leaves in the gin for at least 10 minutes. Strain into a stirring glass, add the Martini and orange bitters, then add about 8 ice cubes and stir vigorously for about ten seconds to chill down the drink. Strain into the ice cold glass and add the lemon twist, making sure the essential oils from the peel hit the surface of your drink.